As promised here are some photos of my new shop stock as well of some new images of my old products. This entry was posted in Blog on September 28, 2010 by Handmade Cuddles. I have been taking it easy since I hurt my back. It is mostly fine now but I have to be careful I don’t sit slumped up and such. I did a lot of sewing over the weekend, and also started and finished a new website project. Beginning of October in the Netherlands is Childrens book week. Last year I worked with Eva Lenis and we made a small flash game for a book store and they ran a competition with it (they had over 500 entries!!). After such a success last year the book shop asked me and Eva to make something new for this year. So I developed a flash based paint program and Eva made all the illustrations for it. It has turned out really well and I hope it works really well for the book store again this year. When the site is launched I will post a link for everyone. This entry was posted in Netherlands on September 20, 2010 by Handmade Cuddles. All unpacked, washing all done and I had some time to sew this weekend. Today is Monday, start of the week and start of a big to do list (mostly website work this week, lots to catch up with). I am currently working on a website for Fietsje (a bike shop in Groningen) and I decided I would make a small gift for Suzanne (the shop owner). I gave the gift without taking a photo of it (silly me!) so here is the design sketch I did for it. I don’t usually make gifts for my clients, but I have put a lot of time into the Fietsje website and have a real sense of proud about how it is turning out (plus they have a very sewable logo which is what I used on the keychain). This entry was posted in Custom Orders, Felt on September 13, 2010 by Handmade Cuddles. 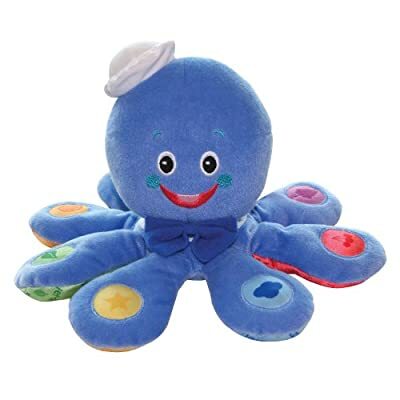 It was so sad to see him crying his eyes out when it came to bed time and he didn’t have his octopus to cuddle. I promised we would go out the next day and see if we could find him (or at least a replacement) but we had no luck so instead had ice cream! But when I got home, I still felt so sorry for him so wanted to try and make him a new octopus. And well I spent all weekend working on the pattern, who would think 8 arms would be so difficult to work with! 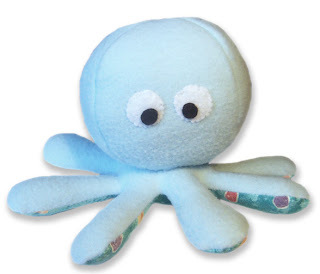 Eventually I got a pattern that works and here is my finished octoplush! I am so pleased with it, it is not identical, I just couldn’t make the big smiley grin look good on my light blue fleece. I gave it a fabric belly to add some colour and pattern to the plain blue. And of course mine doesn’t light up and play music, but I hope it will make Max a bit happier. This entry was posted in Blog on September 6, 2010 by Handmade Cuddles. As promised in my last post here are some holiday snaps of Broad Haven. The beach on a lovely sunny day and sunset over the sea. A lovely calm view over the sea from higher up. I will post again next week with some images of new things I plan to sew this weekend! This entry was posted in Life on September 2, 2010 by Handmade Cuddles.